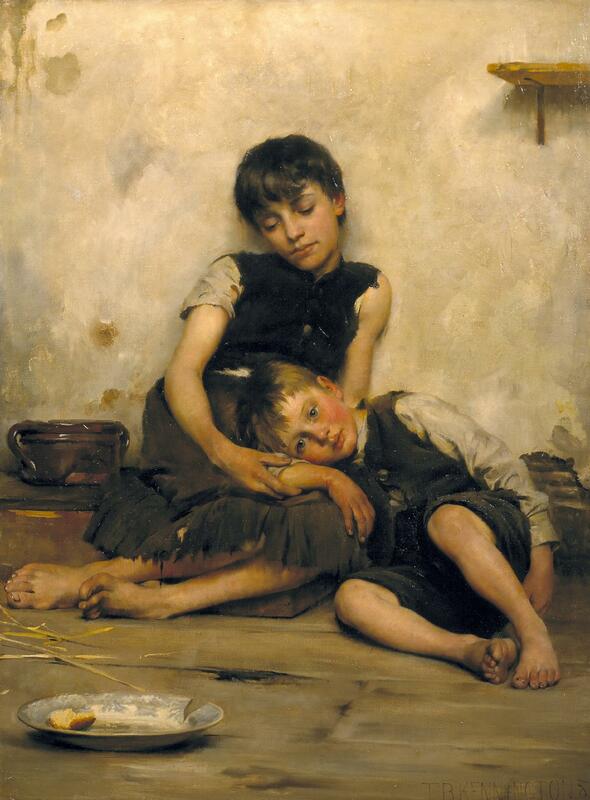 His best-known work is probably Orphans (1885), which is in the Tate in London, but others such as Widowed and Fatherless (1888), The Pinch of Poverty (1889) and Homeless (1890) are also well known. He was commissioned by benefactors to produce a series of such works to promote their charitable causes, but there was an artistic source as well: in the choice of subject and the "rich colouring, smooth handling of paint, and subject" of such paintings he is felt to have been inspired by the seventeenth-century Spanish artist, Murillo ("Orphans"). Kennington himself was an inspiration to others, as a member of the St John's Wood clique, a group of artists in that part of London who were interested in history painting and particularly in "imaginary situations that captured the mood of bygone times" — often including children (Lambourne 144). He also taught at the St John's Wood Art School during the mid-1890s. He later became a founder member of the advisory body called the Imperial Arts League, set up in 1909, which would become known as the Artists' League of Great Britain. Freeman, Julian. "Kennington, Eric Henri (1888-1960), artist." Oxford Dictionary of National Biography. Online ed. Web. 1 March 2017. "Kennington, Thomas Benjamin LARA (London Atelier of Representational Art). Web. 1 March 2017. "Imperial Arts League." Artist Biographies (British and Irish Artists of the 20th Century). Web. 1 March 2017. "Orphans." Tate. Web. 1 March 2017. "The Pinch of Poverty." Art UK. Web. 31 December 2018.